Port of Zeebrugge: The port, built in 1907 on the coast of the North Sea and used by the Germans for U boats in WWI, is very large and handles over 50 million tons of cargo per year. It includes a container port, a ferry port and a cruise port which is located in a very busy industrial area of the port so walking around is not an option. 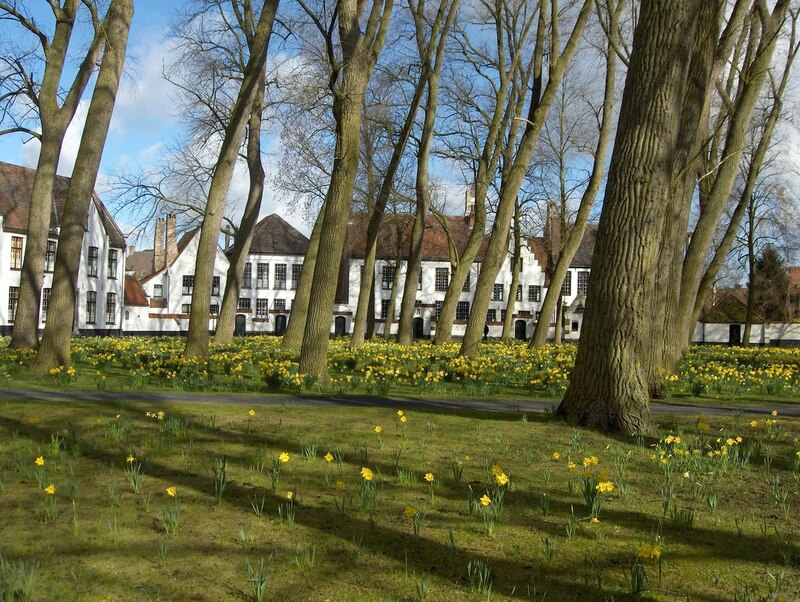 There is really nothing to see or do in Zeebrugge, but there is a small quiet beachside town, Blankenberg, located about one mile away. It has a few restaurants and limited shopping. If you decide to venture to Blankenberg, a free shuttle bus is provided to take you from the cruise ship to the exit of the port. 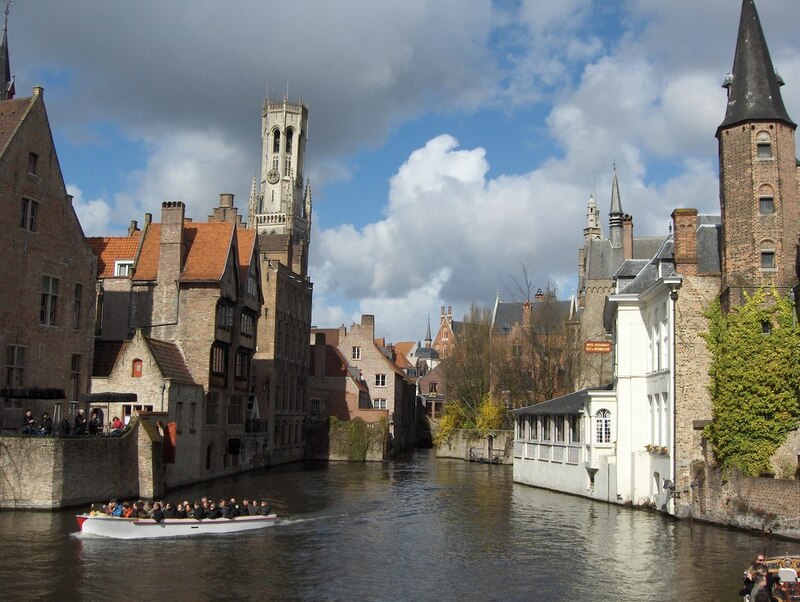 Other places to visit are Bruges, Ghent or Brussels. These can be reached on your own, but it is always better to take a Princess excursion so you are assured the ship will wait for you in case of being detained for one reason or another. 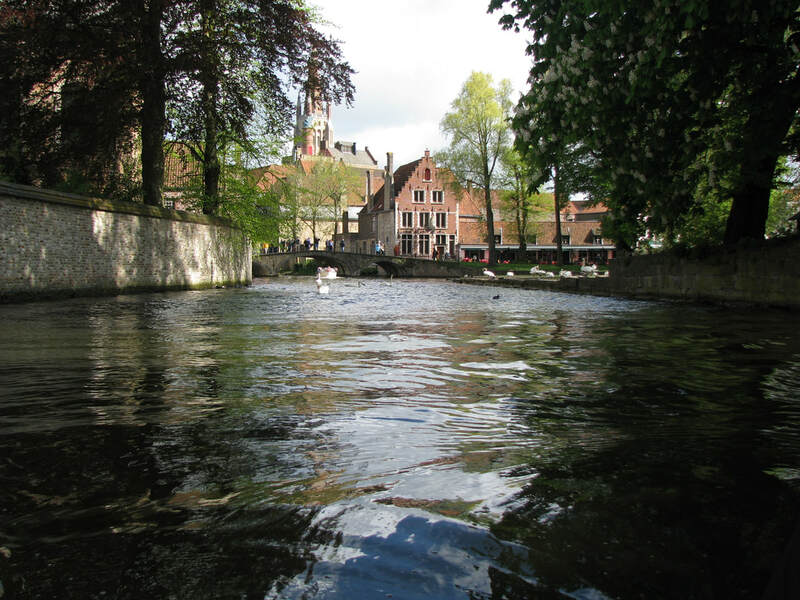 Excursions: One excursion would take you through the Flemish countryside to the small towns of Damme and Loppem. 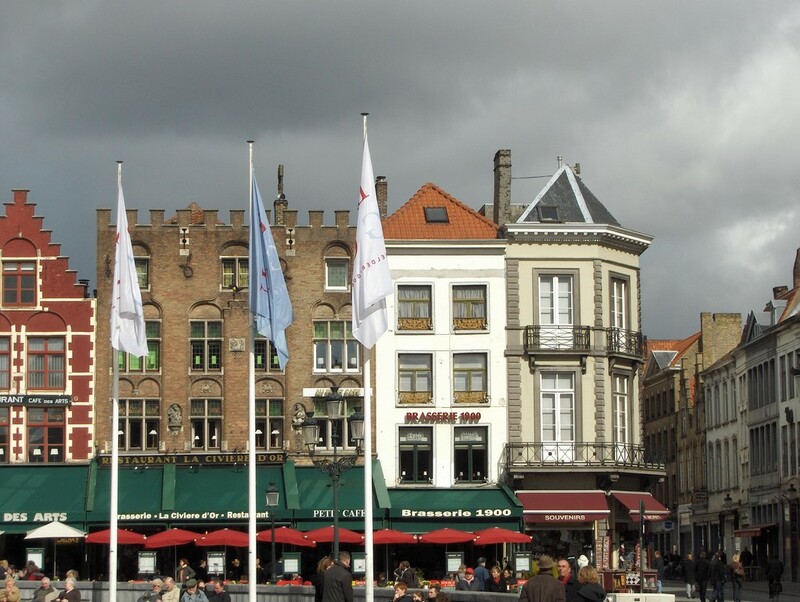 Another was to Brussels where you would visit Old Town and the magnificent Grande Place with its old guild houses and the town hall and the not-to-be missed “Manneken-Pis”, one of Brussels most famous sights! 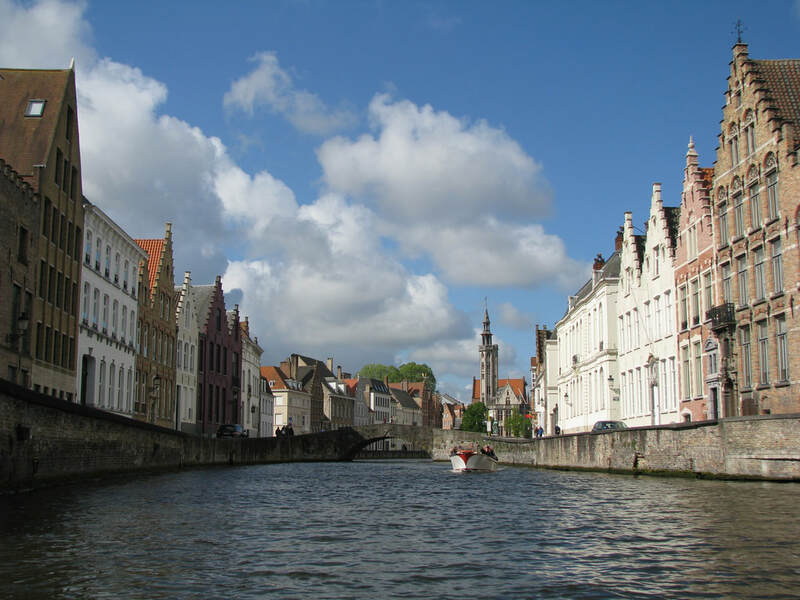 Ghent with its canal cruises and chocolate-making demonstration was another possibility for an excursion. 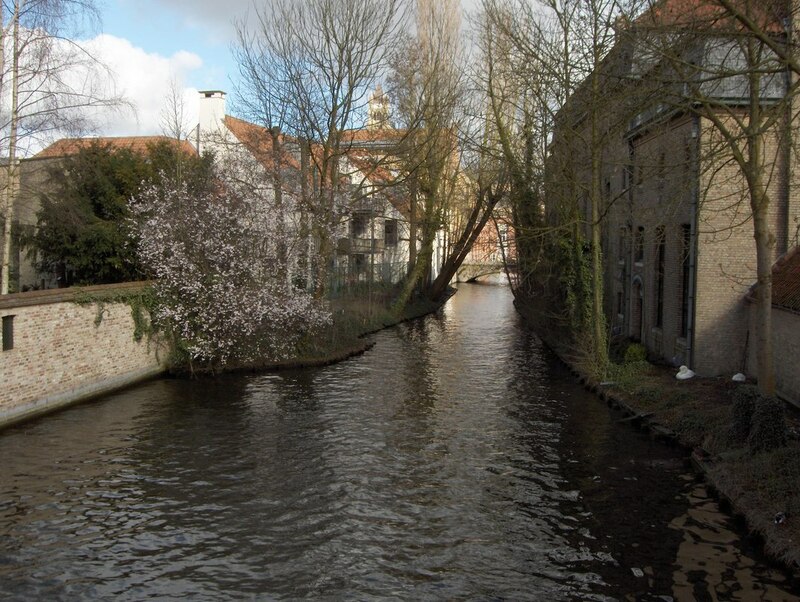 There were several different tours to Bruges including ones that would take you to see all the highlights of this medieval town with its many canals as well as those that would allow you to taste the famous Bruges beers and watch the delicious chocolates being made. 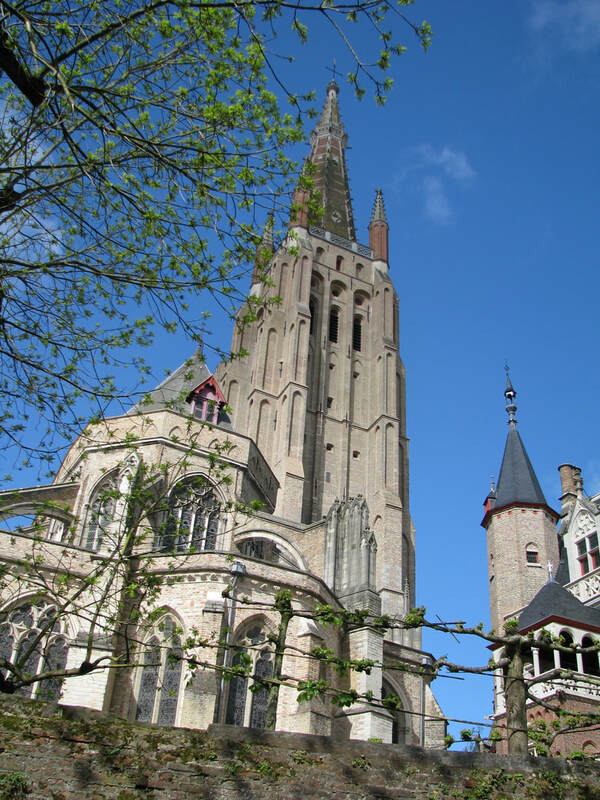 The drive from port to Bruges, a small medieval town, is about 12 miles. Seen along the way - a preview. 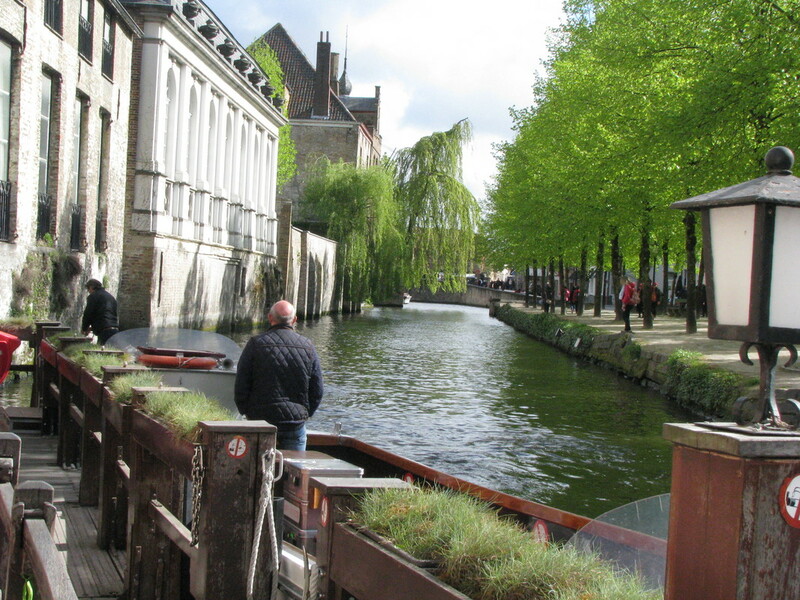 Arriving at Bruges - known as "Venice of the North" because of beautiful canals that run throughout the city. Several places along the canal to get a boat ride. 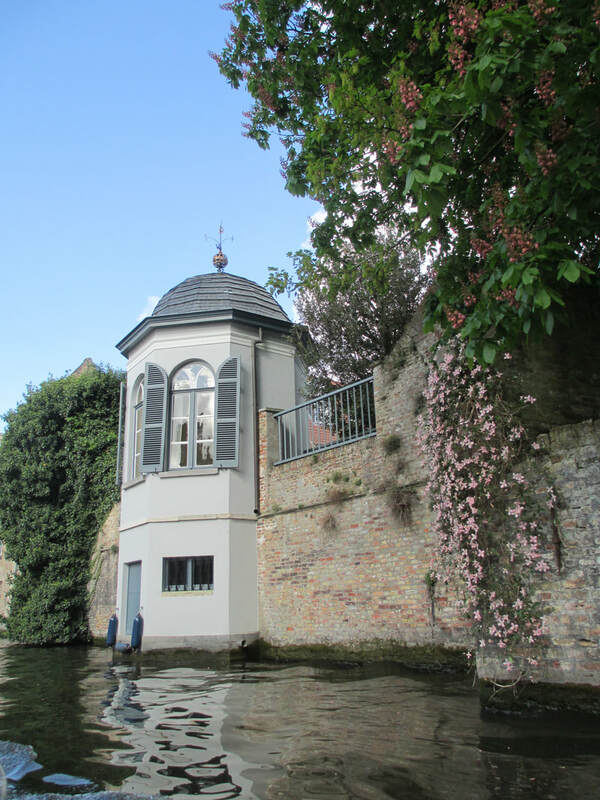 ​Shortly after we arrived at Bruges, our guide led us to one of the several places to board a boat for a 30 minute cruise throughout the canals. 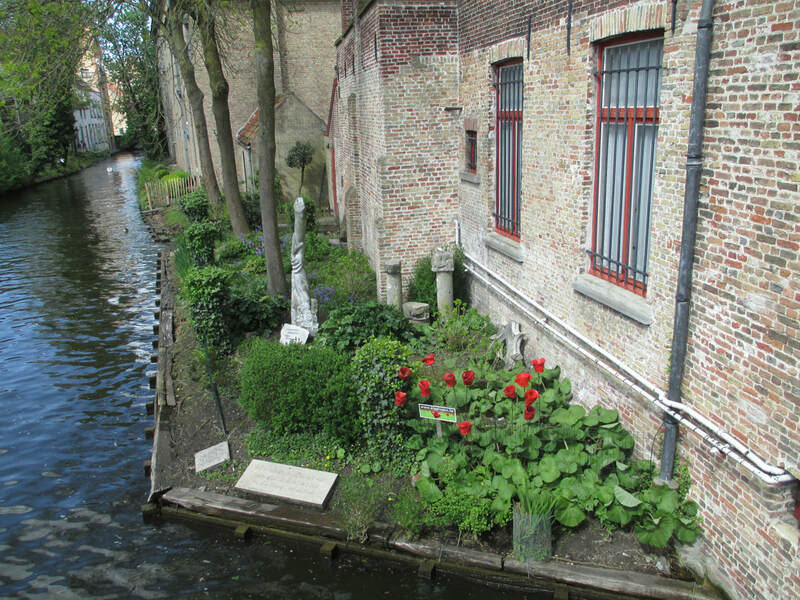 This gave us a good view of the beautiful homes and buildings that line the canals. After the cruise, our guide led us through the cobblestone streets and over bridges that cross the many canals to see all the highlights of the town that were not visible from the canals. 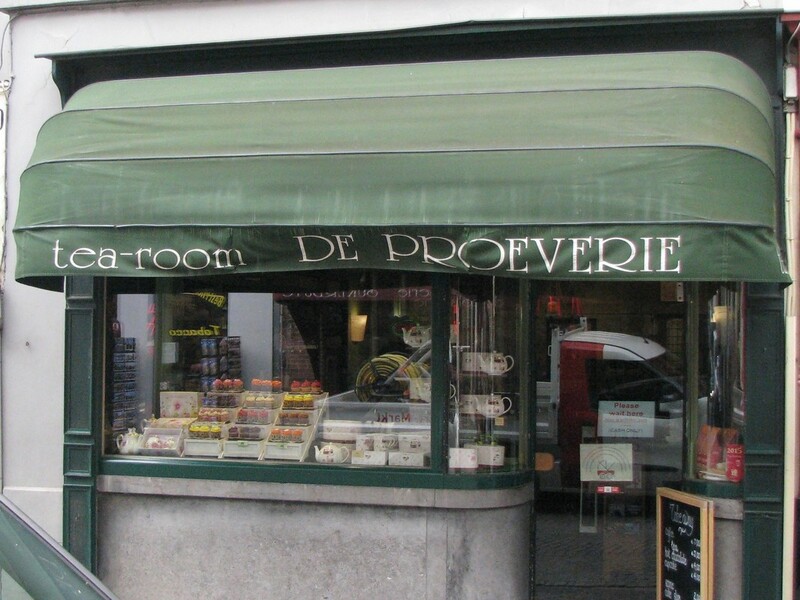 When the tour ended, we found a Tea Room where we could sit and have a lunch of Belgian waffles with chocolate, strawberries and whipped cream along with a delicious cup of hot chocolate. No surprise that we then spent the afternoon shopping for those famous chocolates. 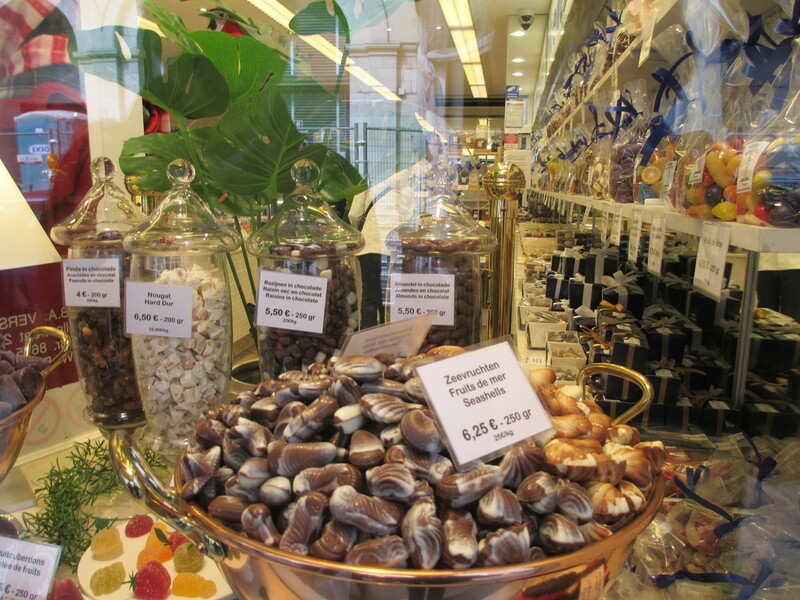 So many shops to investigate and so many chocolates to taste! We also revisited some of the places that we had seen in the morning. 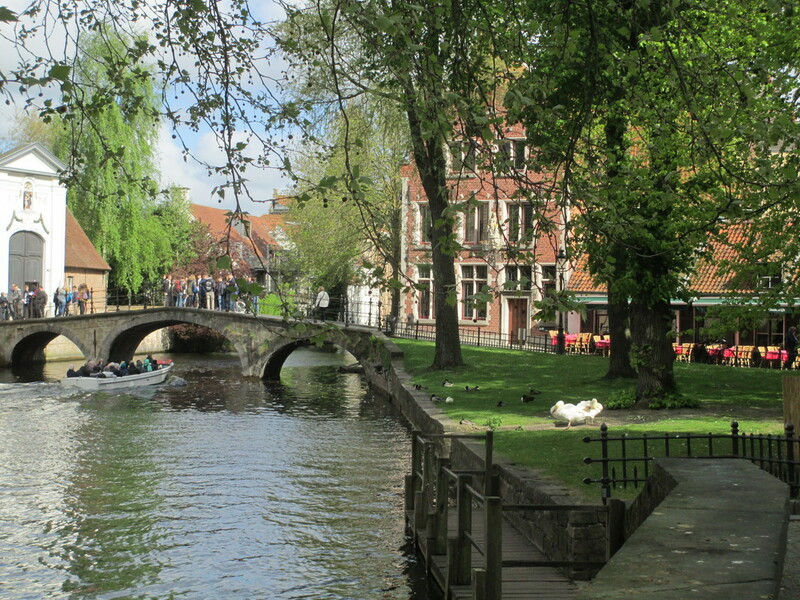 We had visited Bruges on another trip several years ago, but this second visit was just as wonderful as the first. One of our favorite places in Europe! 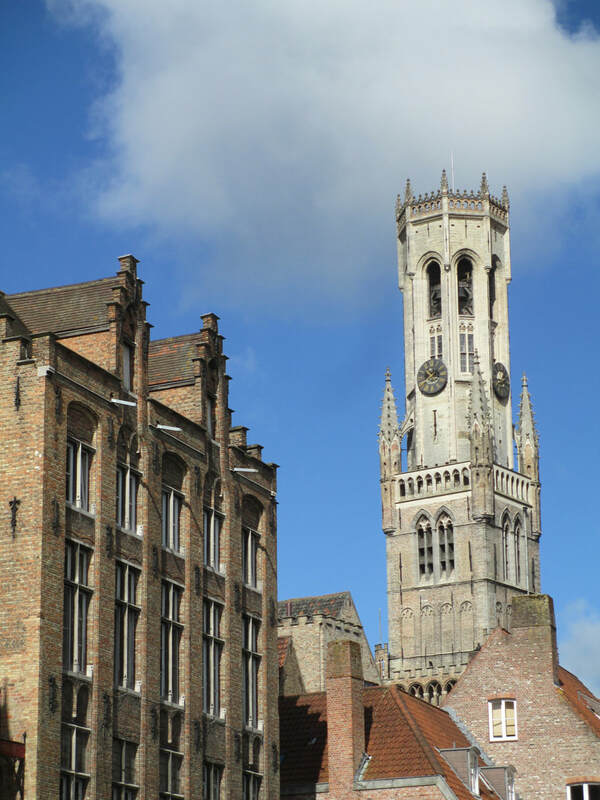 First glimpse of Church of Our Lady's steeple - tallest structure in Bruges. Lots of swans seen along the way. 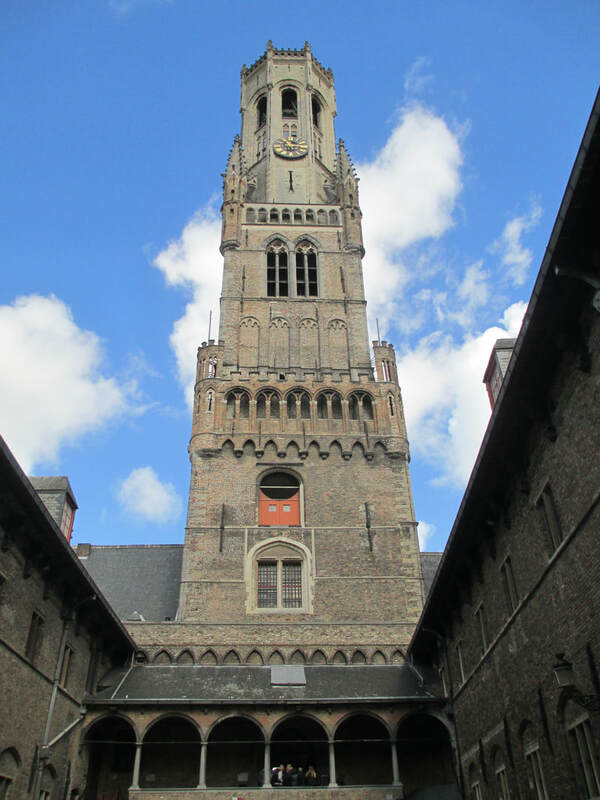 Bell tower (belfry) stands 270' high with 48 bells and a full-time bell ringer. Possible to climb to top of tower if you have the time and energy! 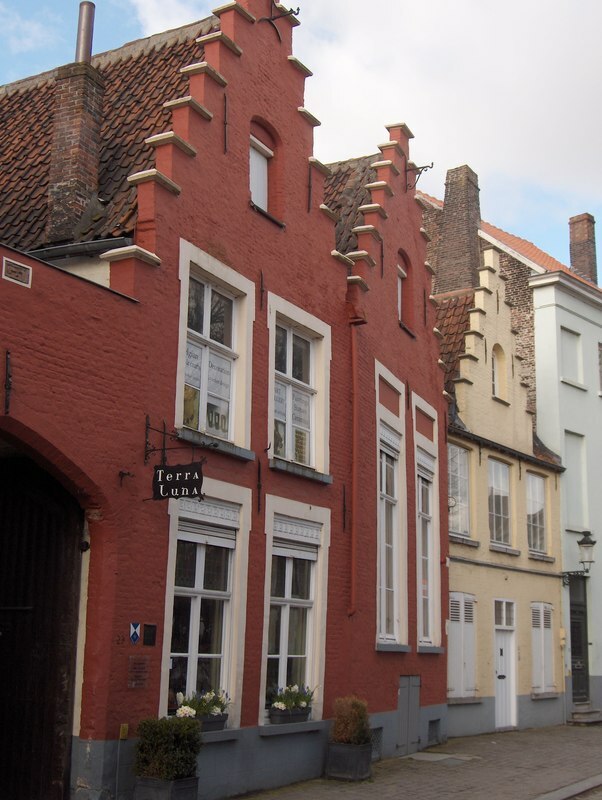 Ancient guild halls in market square. 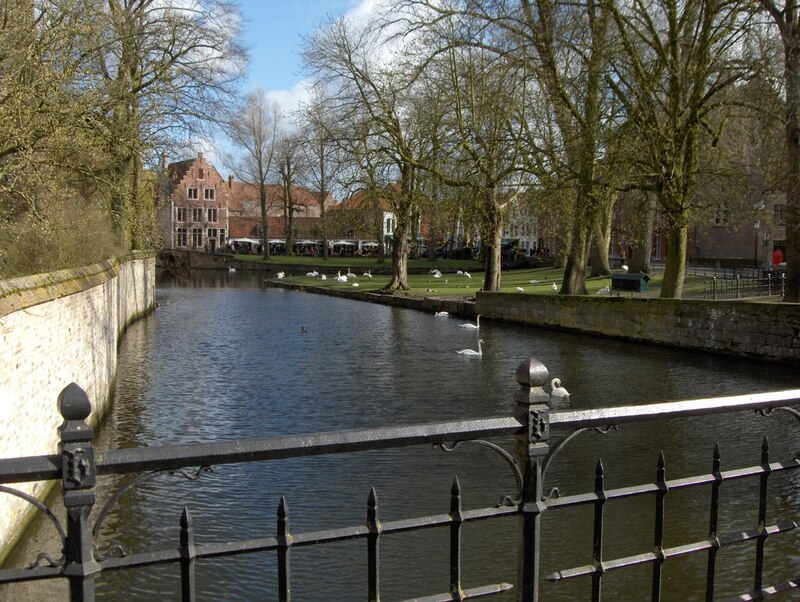 Canals came into market at one time to deliver goods to merchants. 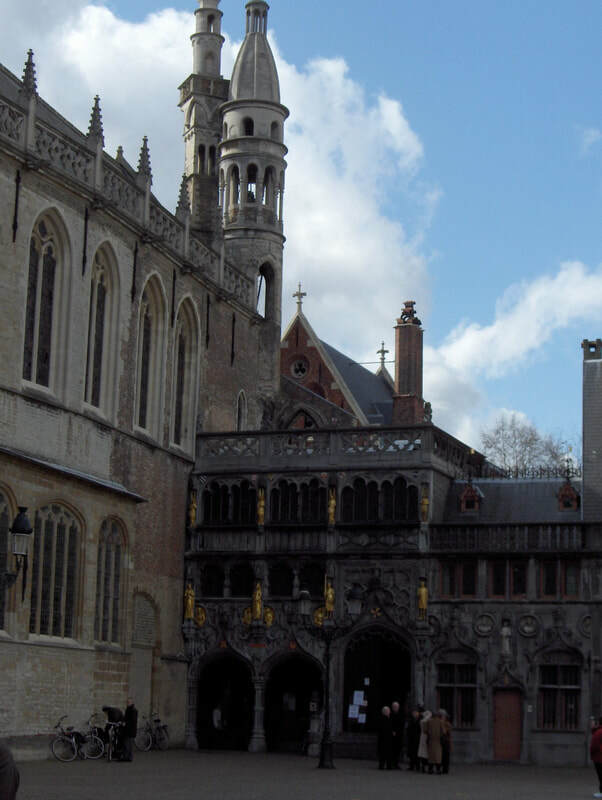 Basilica of Holy Blood - 12th century Romanesque church in the square. 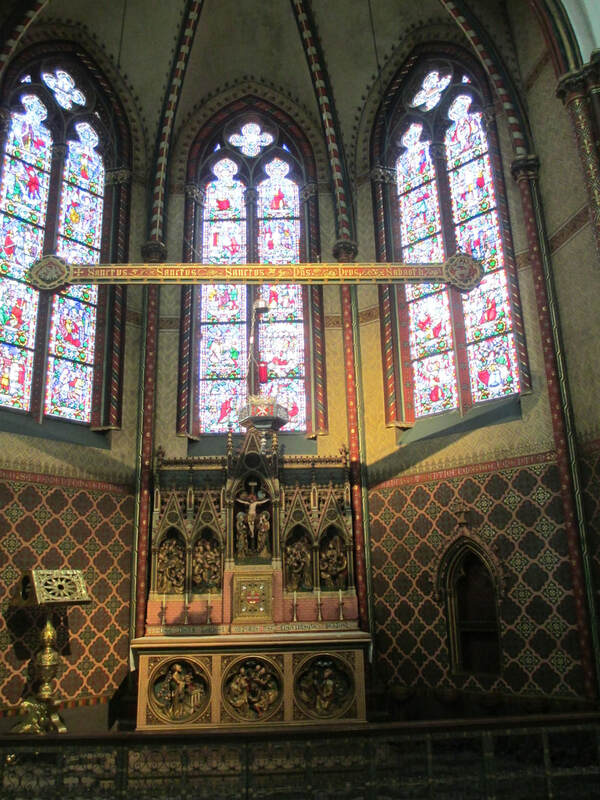 Relic vial of Holy Blood of Jesus brought to city after second crusade is in this church. 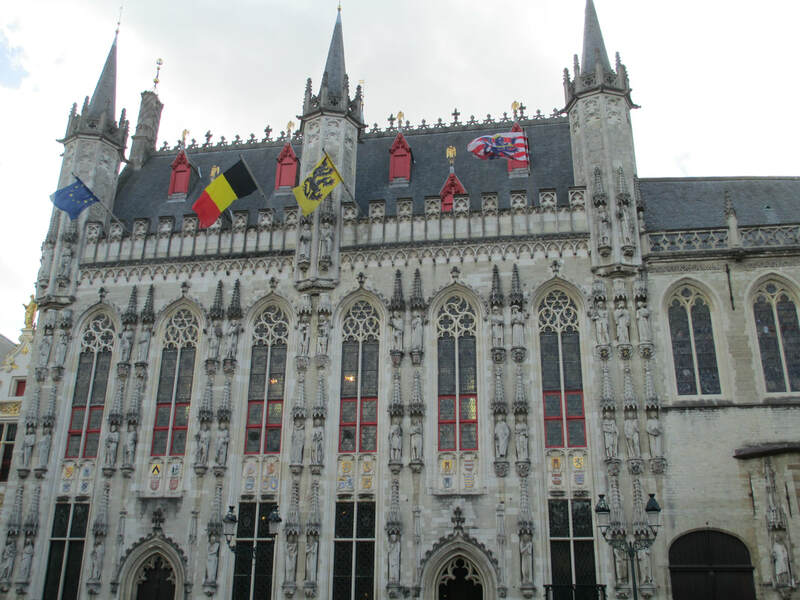 Stadhuis (City Hall) dates back to 1376. 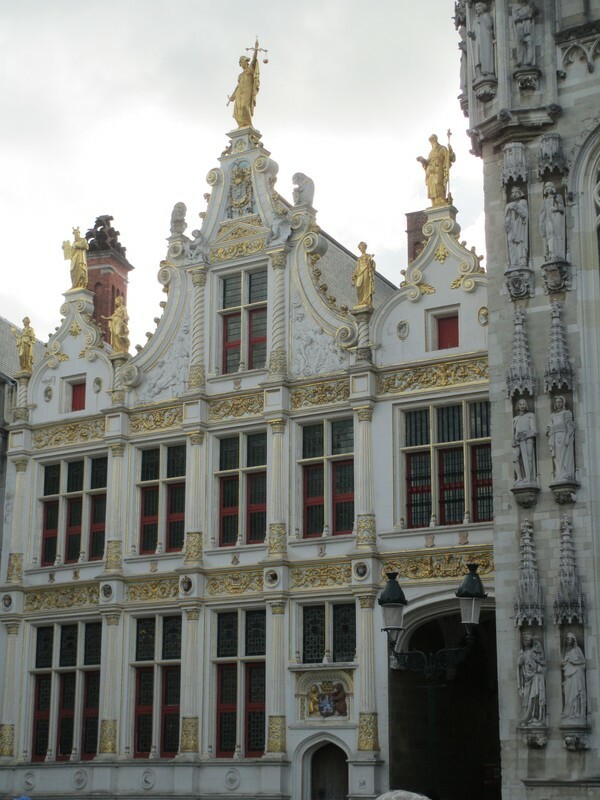 On façade there are niches featuring painted statues of rulers and biblical figures. 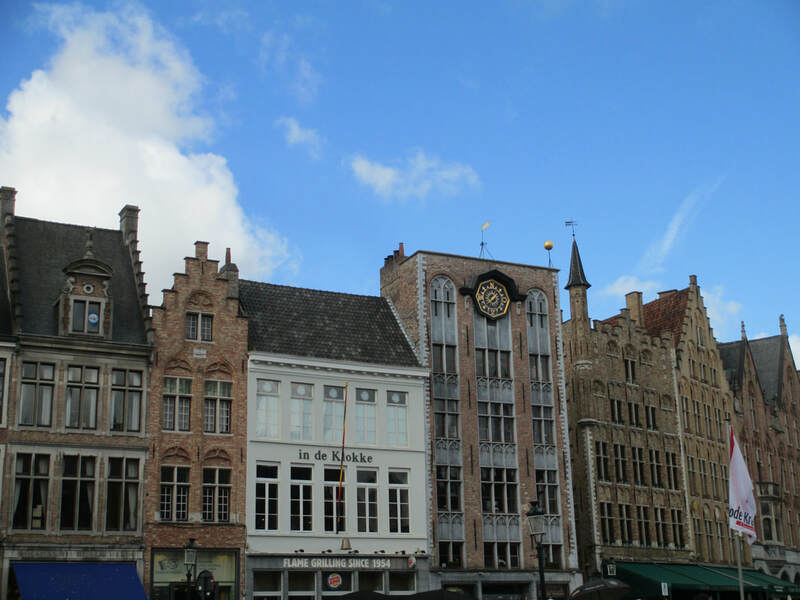 Old Civil Registry is one of the most beautiful buildings in Bruges. Houses original Bruges documents and artifacts. Outside of Church of Our Lady, 13th century chapel and museum. 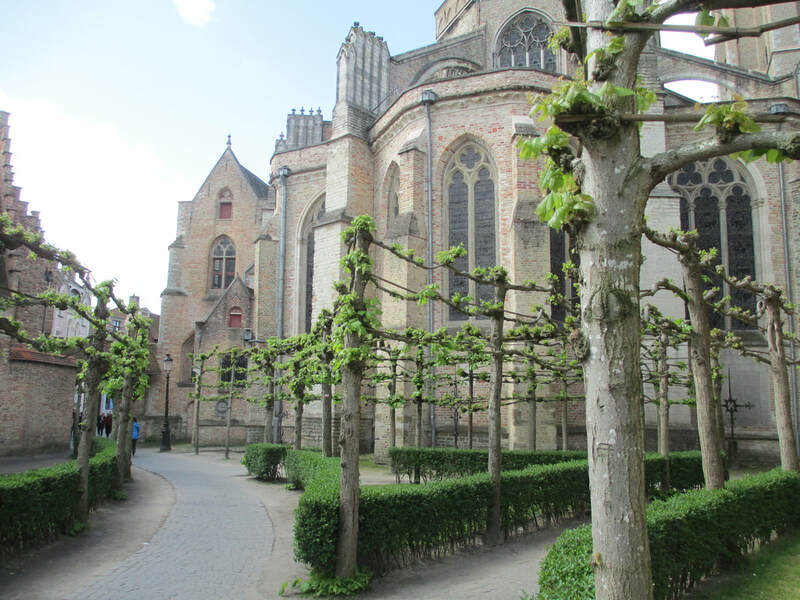 Linden trees surround church. 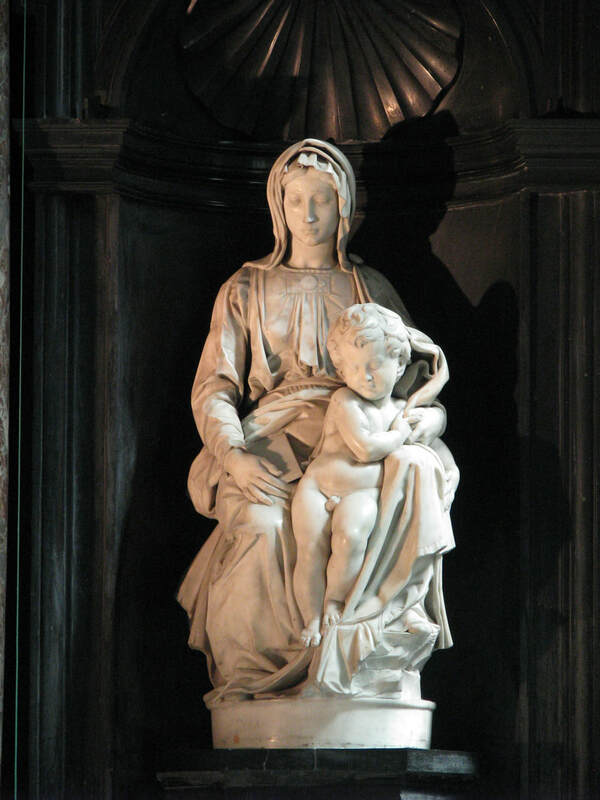 Michelangelo's Madonna and Child - It was removed from Bruges during WWI and WWII by the German Army. 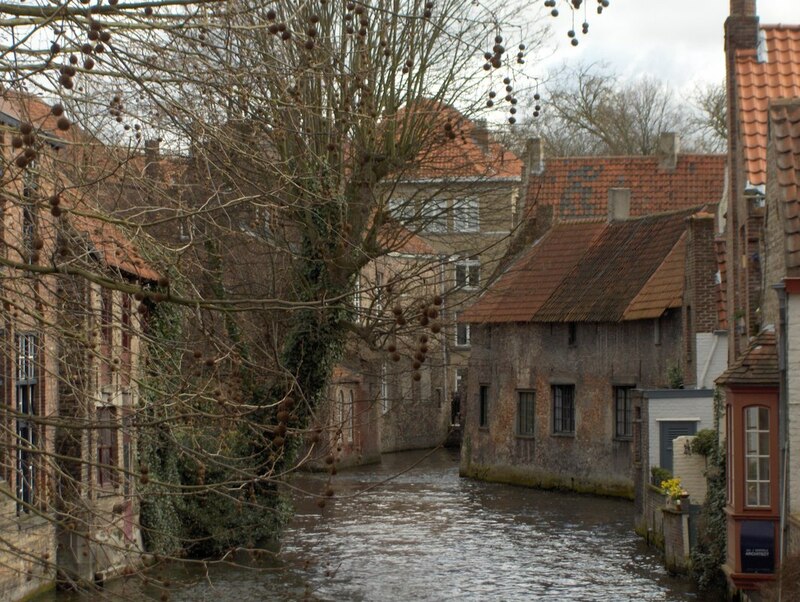 After WWII, American Army found it hidden in an Austrian salt mine and returned it to Bruges. The movie The Monument Men tells the story of its discovery and return. Stopped for lunch at a place where we could sit down. 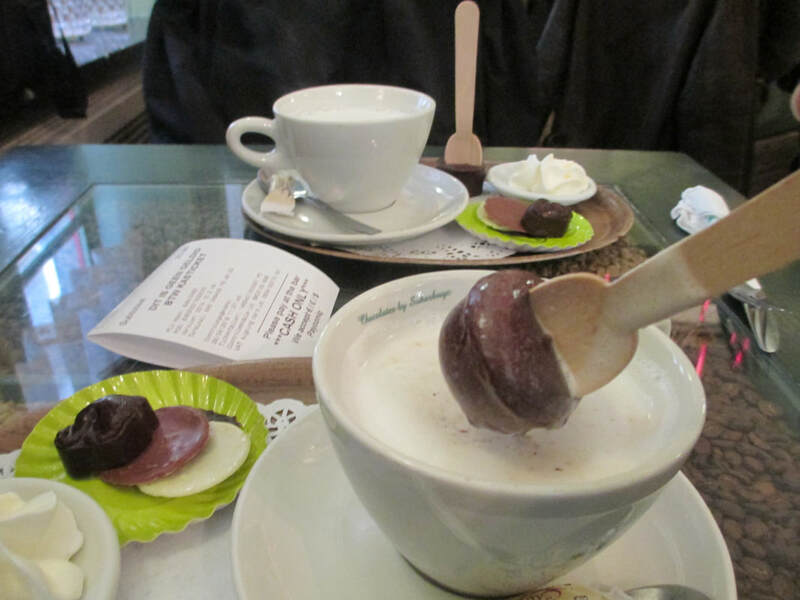 Hot chocolate made by stirring the chocolate on the spoon into the hot milk. Delicious! 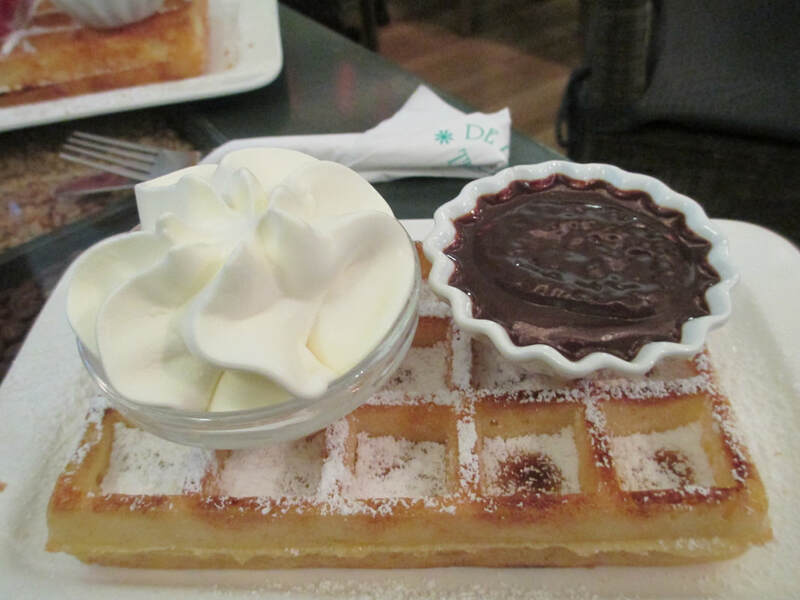 Belgian waffles (gauffres) for lunch! 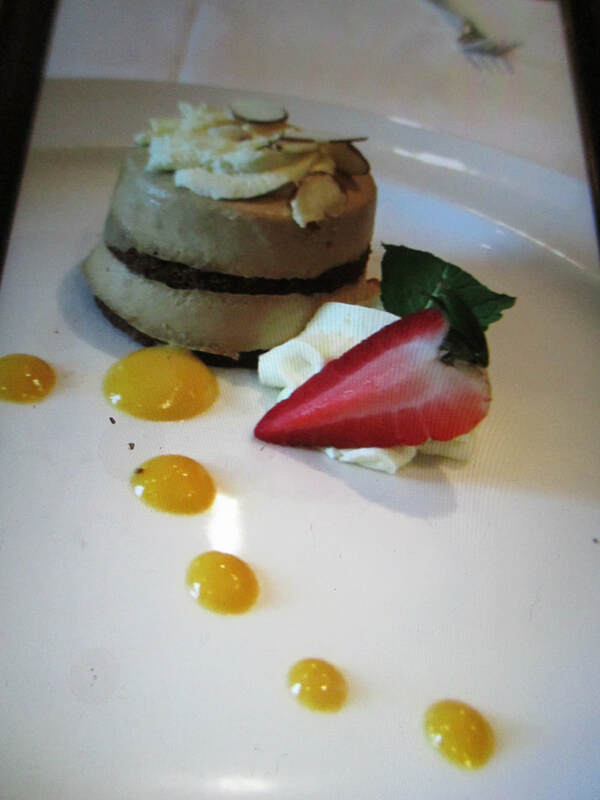 Served with chocolate, strawberries or whipped cream. So good! Next was the search for just the right chocolates. 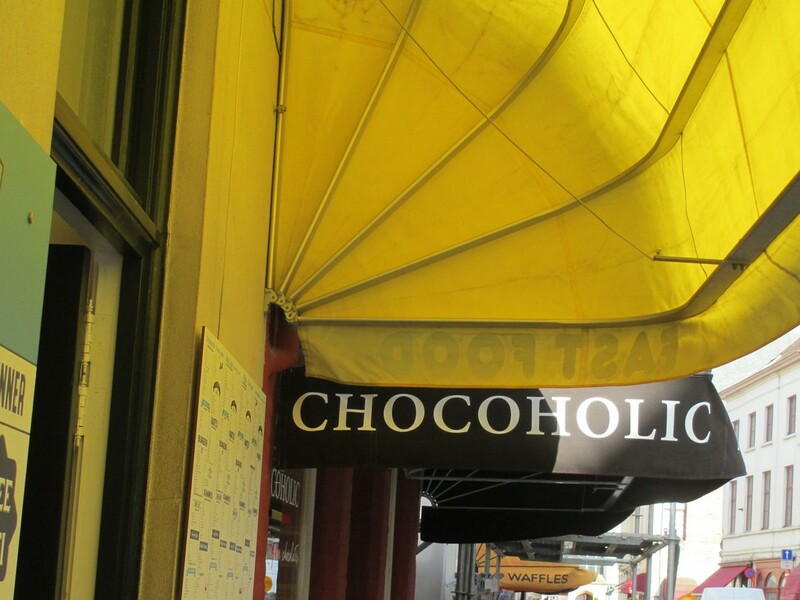 So many chocolate stores, so many choices. These were some unusual ones. And these were really different. 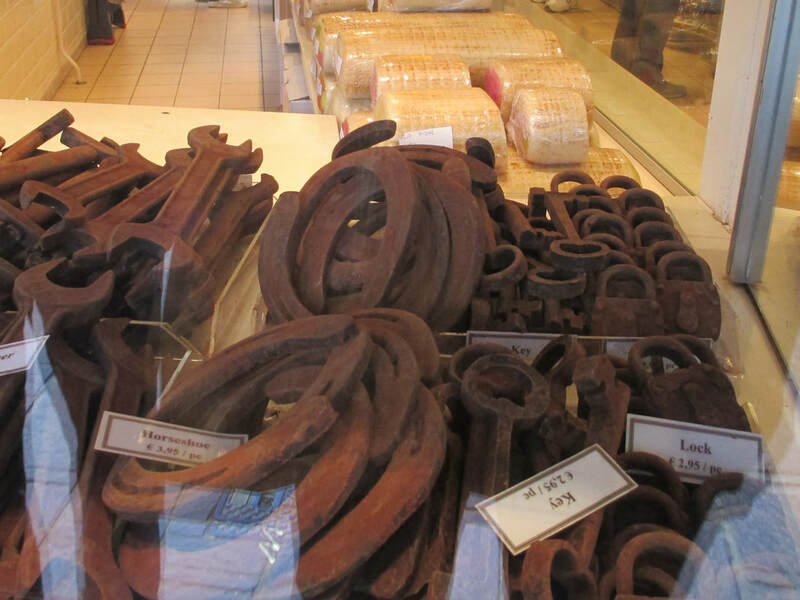 Chocolate horseshoes, keys, locks and various tools. 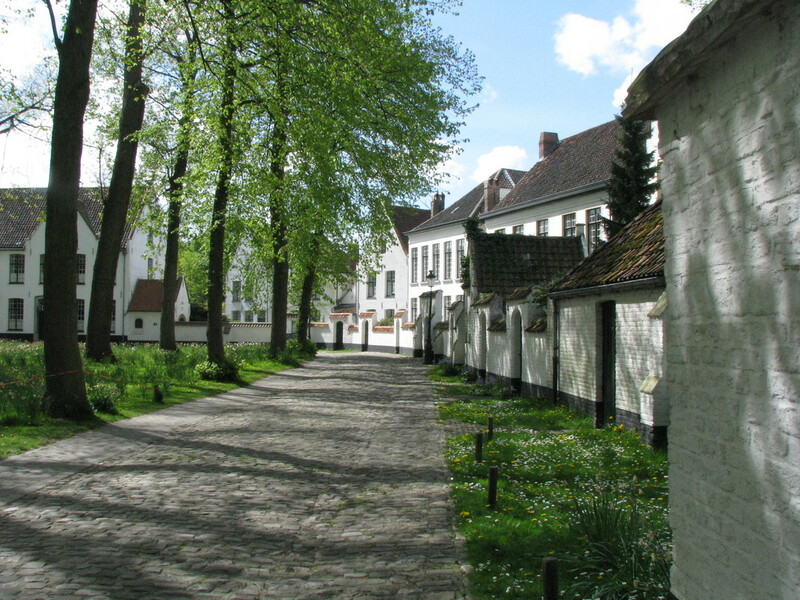 Beguinage ( a retreat) once housed Beguines, founded in 1244. Members of the lay Christian order lived as nuns without having to take vows. 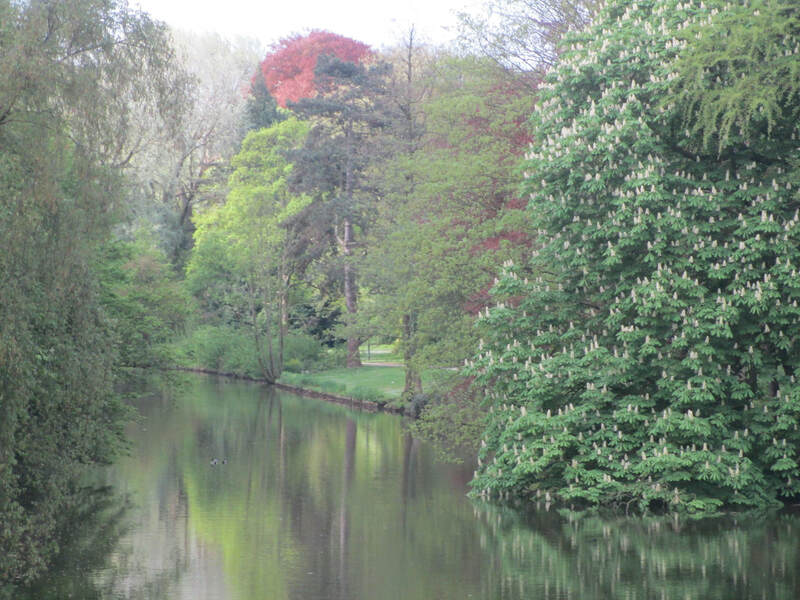 A very peaceful spot in Bruges. 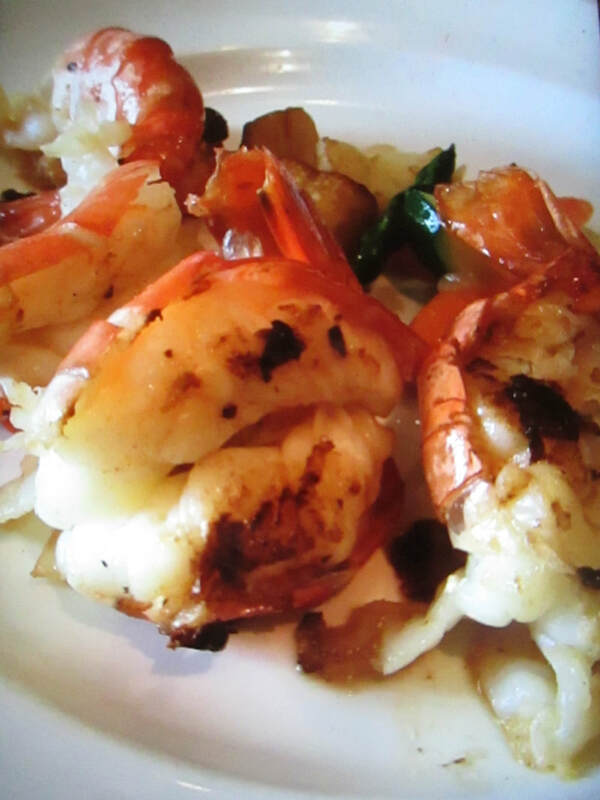 ​Dinner and Entertainment: We got back from our excursion just in time for dinner in our usual dining room and at our usual table. 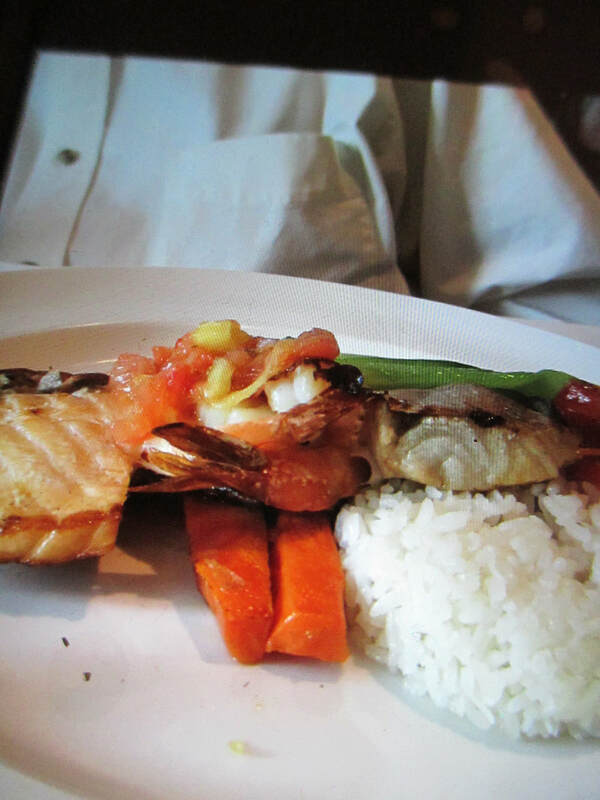 There were others around us who sat at the same tables each night, so we enjoyed getting to know them a little better. 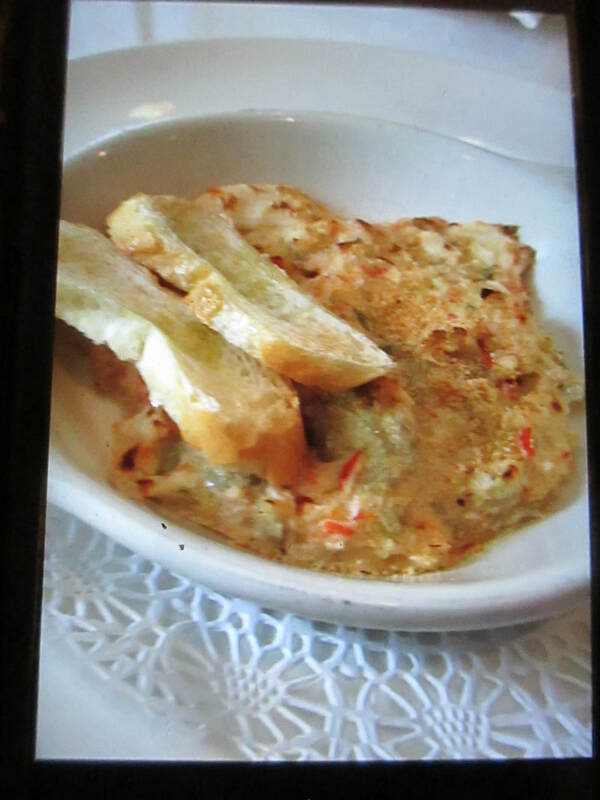 Our meal was delicious as usual and we were able to make it to the Musical ShowTime in the Princess Theater. The entertainer for the evening was Karen Grainger who is known as Canada’s foremost female impressionist. She described herself as one woman with many voices and was very talented as she not only performed the songs of so many famous singers but also often put on wigs to complete the impression. 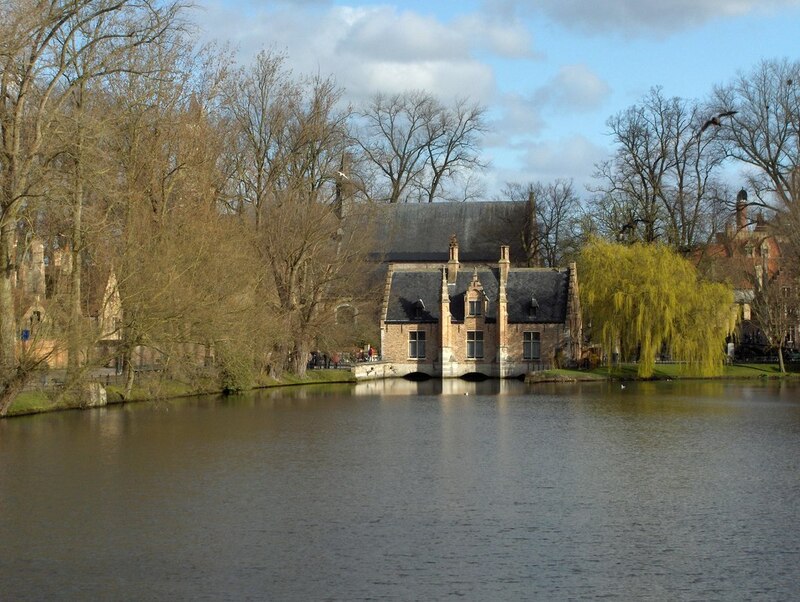 Last stop before we left Bruges was to Lover's Lake.